A black and white photograph of the special service in the council chamber at the Whitby Municipal Building. 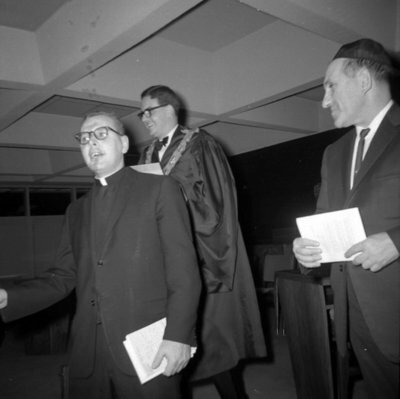 In this photograph from left to right are: Reverend B. Varcoe, Mayor Desmond Newman and Rabbi M. Kutziner. On January 1, 1967 there was a special service in the council chamber of the Whitby Municipal Building to open the year of celebrations marking the Centennial of Canada's Confederation. Winter, Brian ; Newman, Mayor Desmond ; Kutziner, Rabbi M. ; Varcoe, Reverend B. 100-Gun Salute, January 1, 1967, Brian Winter. Whitby Archives A2013_004_305.